NETWORK FINALS: THE MIDDLE gained 0.1 in final numbers, and the rerun of THE FLASH lost the same. Notably, there was no change in the series low NCIS number. CABLE HIGHLIGHTS: Freeform’s final season premiere of PRETTY LITTLE LIARS was at 0.65, down a slim 0.02 from the 2016 premiere. It served as the lead-in to FAMOUS IN LOVE, which premiered at 0.30, losing about half of the LIARS audience, which is fairly typical for shows in that slot. The A&E special LA BURNING was at 0.28. Comedy Central’s PROBLEMATIC launched at, well, a problematic 0.13. Sports dominated the cable night, with both of TNT’s NBA PLAYOFFS games on top at 1.36/1.33, led by Chicago vs. Boston. 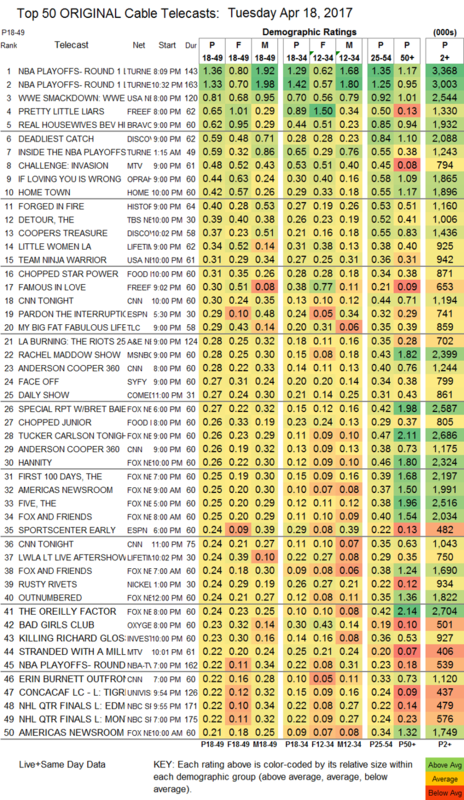 On USA, WWE SMACKDOWN fell a heavy 0.24 to 0.81, and it was followed by TEAM NINJA WARRIOR at 0.31, less than half of what CHRISLEY KNOWS BEST has been doing at 10PM. On Bravo, REAL HOUSEWIVES OF BEVERLY HILLS lost a tenth to 0.62. 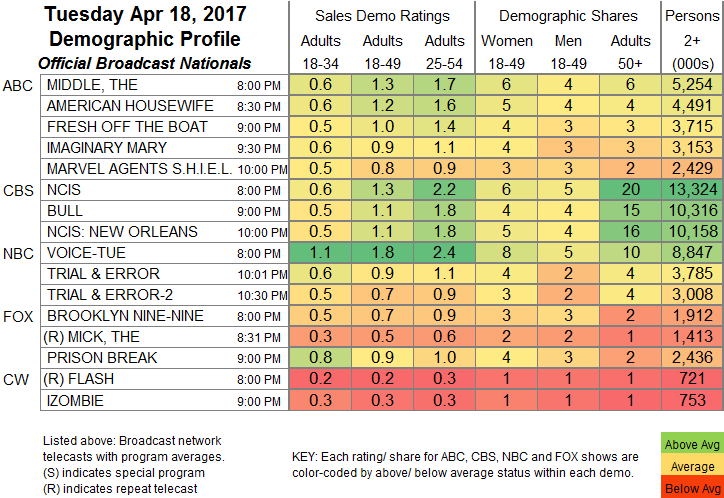 Discovery’s DEADLIEST CATCH shed 0.06 to 0.59, followed by COOPER’S TREASURE at 0.37. On MTV, THE CHALLENGE rose 0.02 to 0.48, and STRANDED WITH A MILLION DOLLARS ticked up to 0.22. OWN’s IF LOVING YOU IS WRONG fell 0.09 to 0.44. HGTV’s HOME TOWN gained 0.04 to 0.42. On History, FORGED IN FIRE dropped 0.14 to 0.40. TBS’s THE DETOUR edged up 0.02 to 0.39. On Lifetime, LITTLE WOMEN LA was up 0.03 to 0.34, with an AFTER-SHOW at 0.24. On Food Network, CHOPPED STAR POWER ticked up to 0.31, and CHOPPED JR ticked down to 0.26. On TLC, MY BIG FAT FABULOUS LIFE shed a tick to 0.29. On Syfy, FACE OFF slipped 0.02 to 0.27, and COSPLAY MELEE ticked up to 0.15. FX’s THE AMERICANS sank by 0.02 to 0.16. BET’s REBEL ticked up to 0.14. WGN’s OUTSIDERS fell 0.08 to 0.13.